The TDA2613 is a hi-fi Audio Power Amplifier encapsulated in a 9-lead SIL plastic power package. The device is especially designed for mains fed applications (e.g. tv and radio). TDA2613 Pinout will be updated soon..., now you can download the pdf datasheet to check the pinouts ! 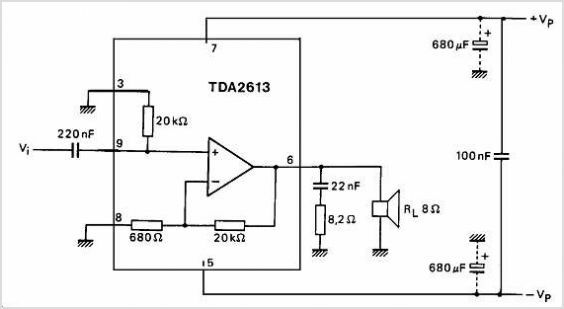 This is one application circuit of TDA2613,If you need more circuits,please download TDA2613's pdf datasheet.